ASTANA – Air Astana is celebrating success, as the company was named Best Airline in Central Asia/India for the fourth successive year and Best Airline Staff Service in Central Asia/India for the third year at the 2015 Skytrax World Airline Awards. The honour follows the Air Transport World Market Leader Award received in February. 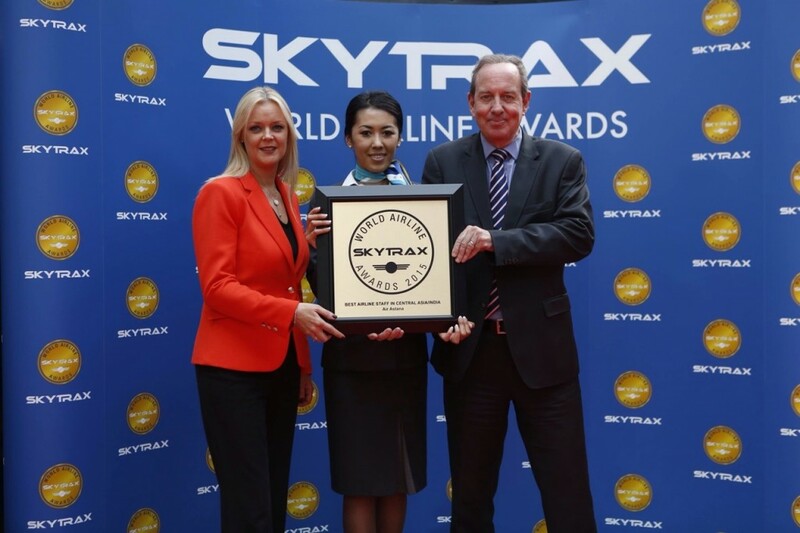 The Skytrax awards are recognised throughout the world as a benchmark tool measuring passenger satisfaction among business and leisure travellers across all cabins (first class, business class, premium economy class and economy class). Air travellers were surveyed by telephone, questionnaires and online about their experiences during a 10-month period on the ground and in the air. The survey measured passenger satisfaction across a wide range of performance indicators of front-line products and service including check-in, boarding, onboard seat comfort, cabin cleanliness, food, beverages, in-flight entertainment and staff service. The survey covered more than 200 airlines, from the largest international companies to smaller domestic carriers. The recognition is due to Air Astana’s flexible offers and comfortable conditions, said CEO Peter Foster. “We are delighted to have won the award for the fourth consecutive time and would like to thank our customers for having voted for us. We do not take your loyalty for granted and we will continue to work hard to improve both product and service,” he added. A leading company in Central Asia, Air Astana has established long-term client relationships with well-known aircraft leasing company Air Lease Corporation (ALC). The company, based in Los Angeles, California, has customers throughout the world. “We have a long history and an excellent relationship with Air Astana and we are pleased with the opportunity to be a part of modernising their fleet,” said ALC Executive Vice President Alex Khatibi. ALC announced long-term lease agreements with Air Astana June 16 for seven new Airbus A320neo family aircraft, including two A320neos and five A321neos and LRs. One A320neo is scheduled for delivery in spring 2016, while the remaining aircraft are set to be delivered in 2018 and 2019. “This lease transaction with ALC is an important part of Air Astana’s fleet modernisation,” said Foster. Air Astana operates a fleet of 30 aircraft composed of three Boeing 767-300ER, five Boeing 757-200, thirteen Airbus A320 family aircraft and nine Embraer E-190. The company’s offers are a market-driven effort that combines a focus on field-level engagement and specific client demands, as this month the airline launched new services from Astana to Seoul, South Korea and Tbilisi, Georgia. Air Astana began regular flight operations on May 15, 2002 and currently has a network of 64 routes between 39 international and domestic destinations.